Jeffrey H. Vick has been the Instrumental and General Music Educator at Anderson School since 1993. He received his Bachelor of Music Education degree from The University of Arizona (1989) and Master of Education in Music degree from Montana State University (1991). 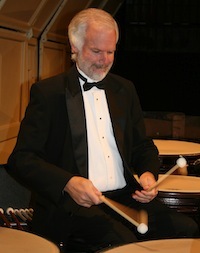 In addition to teaching at Anderson School, he is the Instrumental and General Music Educator at LaMotte School District #43, and Adjunct Instructor of Music (MUSI 428 – Gamelan Sekar Gunung) at Montana State University-Bozeman, Principal Timpanist and Percussionist with the Bozeman Symphony, Intermountain Opera, Big Sky Classical Music Festival, Montana TheatreWorks, and Montana Ballet Orchestras, a member of PercOrchestra, Flutes and Friends, Bozeman Trail Chamber Players, and maintains a private studio. He was also Principal Timpanist of the Billings Symphony from March 2007 to April 2015. He has appeared as a guest artist or soloist with the Ahn Trio, Bozeman Symphony, Cascade String Quartet, Gallatin Woodwind Quintet, Mannheim Steamroller, Mistral Duo, MSU Percussion Ensemble, MSU-Billings Percussion Ensemble, and the MSU Chamber Orchestra. He has served as an adjudicator for the Montana District Four, Five, Six and Nine Music Festivals, the Eastern Half State Music Festival, All-State Band and Orchestra Auditions, All-Northwest Band and Orchestra Auditions (2008, 2010, 2012), Montana State University Applied Lesson Juries, and the MSU Concerto Competition. Conference presentations include the Montana Music Educators Conference (1998, 1999, 2004, 2005, 2007, 2008, 2011, 2013), the Montana Chapter of PAS Day of Percussion (2008, 2012, 2016), and the International Conference on Percussion Music at The University of Arizona (1995). He is the recipient of a Montana Arts Council Individual Artist Fellowship Award (1992), and a Phi Delta Kappa Professional Development Grant (1998) for gamelan study/research in Bali, Indonesia. He’s been listed in the Marquis Who’s Who in America, Who’s Who in American Education, and Who’s Who in the World. Professional memberships include: the American Federation of Musicians (Bozeman Musicians Association – Local 709), MENC: National Association for Music Education, Montana Music Educators Association, Montana Bandmasters Association, Montana General Music Teachers Association, National Education Association/American Federation of Teachers (NEA/AFT-MEA/MFT), Percussive Arts Society (current Vice-President of the Montana Chapter of PAS, and editor of Montana Percussion News), Phi Delta Kappa and Phi Mu Alpha Sinfonia. The Anderson School Fine Arts Curriculum (Dance, Music, Theatre and Visual Arts) has been updated to reflect multi-grade level rotations (Grades 5-6 and 7-8), Technology applications (software and hardware) for Music K-8, Indian Education for All, and includes a framework and Arts examples for 21st Century Skills and Common Core State Standards. The Instrumental Music program at Anderson School began in 1988 as lunch-recess program with one beginning band group, expanding the following year to two groups (Beginning and Intermediate-Advanced Band). Currently, there are three different bands offered at Anderson School. Meets Monday, Wednesday (2:50-3:20) and Friday (11:20-11:50). You will need the “Measures of Success – Book 1″ for your instrument, and a Black (preferred) 1” three-ring binder with pockets for sheet music. Meets Tuesday and Thursday from 2:30-3:15. You will need the “Measures of Success – Book 1″ at the start of the year, and continuing with “Essential Elements – Book 2” (green/yellow cover – school provided), and a Black (preferred) 1” three-ring binder with pockets for sheet music. Percussion: a stick bag with concert sticks, and drum set sticks (if applicable). Meets Tuesday and Thursday from 12:39-1:26. You will need the “Essential Elements – Book 2” (green/yellow cover – school provided) for your instrument, “Essential Technique” (black/yellow cover – school provided), and a Black (preferred) 1” three-ring binder with pockets for sheet music. Percussion: a stick bag with concert sticks, drum set sticks (if applicable), and either 1 pair medium yarn mallets (Adams, Balter, Yamaha or equivalent) or 1 pair timpani mallets (Vic Firth T3 Staccato or equivalent). A pencil, your complete instrument, and music is needed in order to participate. At least three working reeds (for wind players) are needed with you every time class meets. Brass instruments should be oiled and in good working order before each rehearsal starts. String instruments should be tuned up and ready to play, with bows rosined if needed. Percussionists are responsible for set-up, breakdown and storage of all instruments, accessories and sticks each time we rehearse. If you are unable to play due to slight illness, dental work, etc… you can still do fingerings and work with the group. IN-SCHOOL = IN-CLASS = PARTICIPATING – have your instrument! Consistent tardiness or absence from rehearsals may result in your dismissal from the ensemble. Home practice time is expected of all (consistent daily practice is far more beneficial than “cramming” for an hour once or twice a week – try to schedule your practice time for 4-5 different days of the week for a period of time so it is “part of the routine” and not something “if I get around to it”). Home=Practice (where you learn your part), Classtime=Rehearsal (where you learn everyone else’s part, plus new concepts and techniques to practice). LOST OR DAMAGED PIECES: You will be charged $5.00 for each lost or damaged original copy of music that was checked out. Books that are lost or returned damaged will be charged at the current retail price plus any additional shipping/handling charges. Jazz Band and Percussion Ensemble pieces sometimes do not have individual parts that can be replaced, and whole set replacements can run $40-$70 each. Cultural – To continue the development of music appreciation and understanding through the study and performance of fine choral literature. Educational – To develop interested and discriminating listeners and performers, and provide a well-rounded background of musical knowledge. Service – To lend a meaningful atmosphere to school and community events while promoting the reputation of the Anderson School Music Program at all performance appearances. Recreational – To provide Anderson School students an opportunity for a worthy and lifelong leisure activity, an emotional outlet, and positive social experiences. Spiritual – Through singing music that is significant historically, musically, or in text, students will learn to appreciate the deeper meanings of life.